Although on the same day several other metal events were taking place, the first benefit concert for Chuck Schuldiner (March 24/Podium/Hardenberg) still managed to set 350 people on their feet. They got to see short gigs of six Dutch bands, which beside their own material, all presented a Death classic. Strikingly, all of the bands mainly choose to play covers from the first two Death albums, something Chuck himself probably would not have been too content with. But in such cases the end justifies the means. Funny detail.... as well as Altar, God Dethroned rehearsed the same old museum piece, "Evil Dead". After some consultation the problem was solved very practically.... 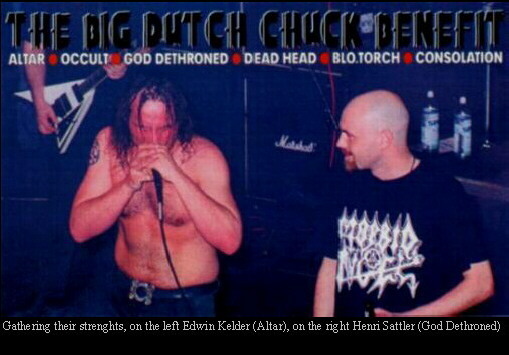 Altar front man Edwin Kelder roared along with the song on stage with God Dethroned and his colleague Henri Sattler climbed the stage later that night just armed with his mic and a bottle of beer to swell the Altar ranks. Consolation thought of something similar and brought along, especially to perform "Infernal Death", Nembrionic's Marco Westenbrink as second grunter. The design of this evening can safely be called unique. All bands played free of charge and Podium/Hardenberg handed over the proceeds of the ticket sales, as well as the profits made on beverage sales, for this good cause! There was enough equipment on stage thanks to the sponsoring of importers such as Pearl drums, Ampeg and Marshall amps. The previously drafted schedule was followed pretty strictly. All bands played 30 minutes and had 15 minutes to rebuild the stage. Only Dead Head (whom after their own gig presented some Death songs with benefit organizer Brian Kersbergen on drums) and Altar (who played a home match and the crowd kept calling them back) were eventually on stage a bit longer. Before the Altar show, Brian Kersbergen told the audience this night brought about 6000 Dutch Florins. Which goes to prove that this enjoyable, varied festival turned out to be very useful as well.